Is the growth from smart management of the feed-in tariff—or is it out of control? Almost 4.4 gigawatts (4,373.5 megawatts) of photovoltaic capacity were installed in Germany in the first half of 2012, according to new estimated numbers from the Federal Association of Energy and Water (Bundesverbandes der Energie- und Wasserwirtschaft, or BDEW). It was the biggest first half of solar PV growth in Germany’s history of subsidized solar PV development, a 47 percent advance on the first half of 2011. Adjustments in the feed-in tariff (FIT) and planned further adjustments were a major factor in driving growth. Growth leapt after a fast first quarter of 1.9 gigawatts. March saw over 1.2 gigawatts (1,222.77 megawatts) added. By June, there were almost 1.8 new PV gigawatts (1,790.21 megawatts) added, almost as much new capacity as in the entire first quarter. It was the second-biggest June in German history after the nearly 2,100 megawatts added in June 2010. For the first time, renewables provided over a quarter (just under 26 percent) of Germany’s electricity (67.9 billion kilowatt-hours of an overall 261.5 billion kilowatt-hours) in the first half of 2012. First half 2012 overall power consumption was 1.4 percent down from the first half 2011 total due to lower production in the electricity intensive industries such as iron, steel, chemicals and paper. Wind led renewables with 9.2 percent, an advance on 2011’s 7.7 percent. Biomass followed with 5.7 percent (2011: 5.3 percent). 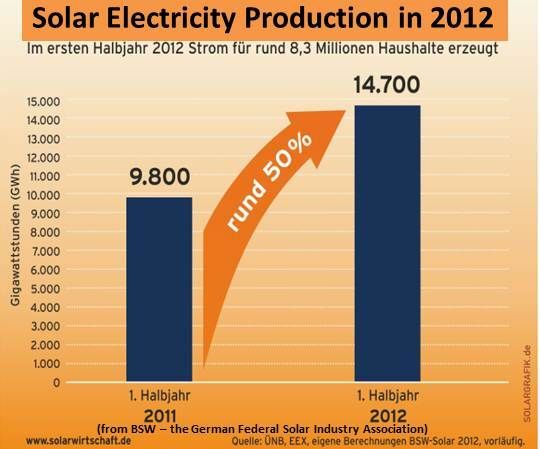 Solar PV went from the first half of 2011’s 3.6 percent of German electricity to 5.3 percent, approximately 14.7 kilowatt-hours generated by 1.2 million PV systems. 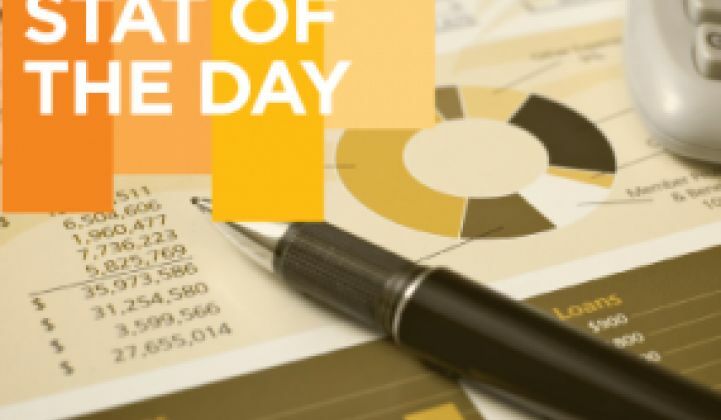 Despite the turmoil in Germany over the proper adjustments to the FIT, the German Federal Solar Energy Association (BSW) predicts solar will get to 7 percent of the nation’s electricity by 2016, while the price will only increase by 2.5 percent. 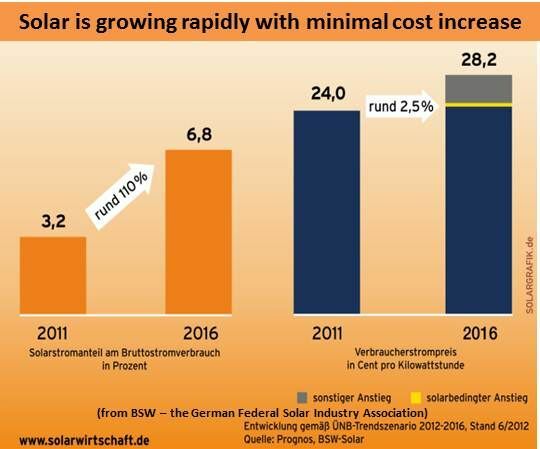 BSW Solar CEO Carsten Körnig reportedly noted there will be a cost for such growth when it is supported by a FIT, but Germany has carefully ratcheted down its ratepayer-funded subsidy to the point where fossil-fuel price increases, Körnig said, exceed the solar incentive costs. And, he reportedly added, Germany’s energy-intensive industries are exempt from any burden from the ratepayer surcharges that support the FIT.